There is no argument about Coleman Hawkins' position as “Father of The Tenor Saxophone.” Nor is there any doubt about his firm dedication to musical modernity. He is often cited as one of the first of the “Swing Era” musicians to have embraced the revolution of Bebop, a sea-change that took the vanguard of jazz away from the big band and back into the small combo. Indeed, many of Hawkins mid-1940s quartet and quintet sessions were to become seminal influences on an even younger generation of jazzmen, including, most famously of all, Sonny Rollins. However, Hawk's interest in more intimate musical settings had begun long before, during the mid-1930s. He was the first jazz saxophonist to record with just piano accompaniment – a challenge few of his peers ever took up – and in among the many orchestral sides recorded during his extended European stay from 1934 to 1939 he documented a further series of outstanding duo, trio, quartet and quintet performances. Recorded for a variety of European labels, these sessions are unjustly neglected masterpieces, generally overshadowed by Hawkins titanic achievements upon his return to America. 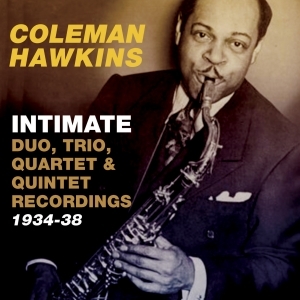 Gathered together in this collection they offer definitive proof of Hawk's cutting edge ambitions: few jazzmen anywhere were playing with such invention, daring and drive in the 1930s, fewer still on an instrument still to convince some of its validity as a jazz voice. Eight decades later, these recordings sound like harbingers; in fact, jazz tenor saxophone starts here. This release features period photographs and a detailed booklet note by saxophonist and author Simon Spillett.